controller and temperature monitors visible. As I suspect most home brewers do, I've constantly worked to improve my knowledge, equipment, and processes. I've gone from extract to all-grain, from my kitchen stove to a dedicated RIMS system, from plastic bucket fermenters to stainless steel fermenters, from pre-crushed grain to freshly-crushed. I've even made efforts to alter my water chemistry to better match the style I'm brewing. I think my beer's gotten better as a result of all that. One aspect I've not controlled well so far is fermentation temperature. In part, this has been because I didn't think I needed to. I brew primarily Belgian beer styles, and most of the Belgian abbey brewers let the yeast ferment at whatever temperature it wants to. They don't try to cool it, because they claim this can make the yeast stall out. They don't heat it unless it drops below the yeast's tolerance range. That has been changing lately. Earlier this year, I added a dual-stage temperature controller and a heat wrap. This helped some of my beers attenuate a little better and kept them from suffering a slowdown in fermentation as the temperatures in my basement dropped lower. What I couldn't do, though was control the upper end of the fermentation temperature. I questioned whether I really needed to have a fermentation cooling option. 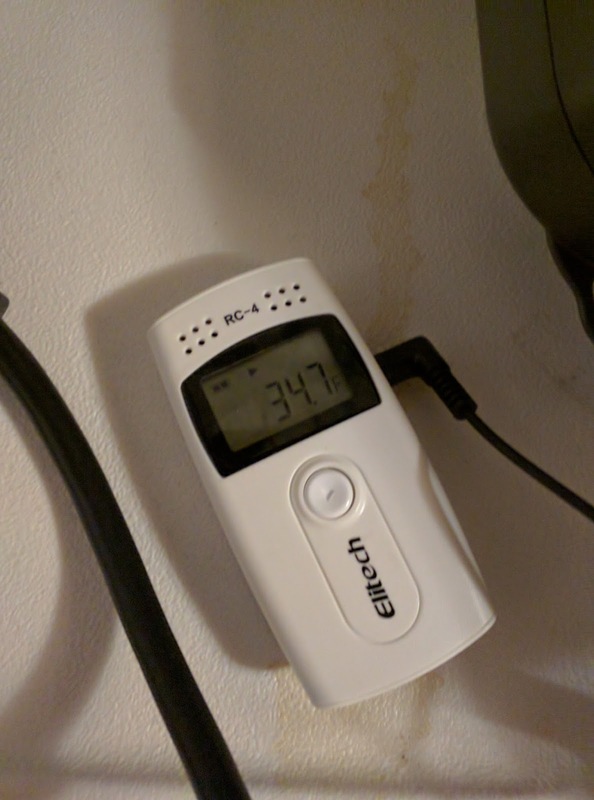 An inexpensive temperature monitor watched one of my Belgian beers ferment, recording the wort's temperature every minute for two weeks. At no time did the wort exceed the yeast's tolerance range. I concluded from this that the combination of a low basement temperature and the thermal conductivity of a stainless fermenter might have been enough cooling. It certainly was for the batch I monitored. Then I ran into a recipe where temperature control during secondary fermentation was required. The recipe called for keeping the beer at 55-60F for 3-4 days, then cooling it to 48F for eight weeks. I purchased a large zippered insulated cooling bag (the large black one pictured above and to the right) and dropped two frozen one-gallon jugs of water inside. This got the fermenter temperature down into the 55-60F range and kept it there as long as I changed the ice daily. I couldn't get it below 55F until I added more ice. There had to be a better way. That's when a web search turned up Cool Zone Fermentation Control's Cool Zone Cooling Jacket. 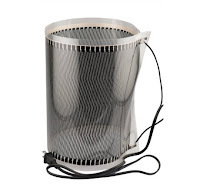 This product is a plastic and Velcro wrapper which goes around your fermenter. Ice water is pumped into the jacket through a convoluted channel and comes out the other side. As water flows through the jacket, the water chills the fermenter. Cool Zone claims to have gotten fermenters down to as low as 36F with this technology. It took me about ten minutes to read the setup instructions, hook up the lines, fill the cooler with water, drop in the ice jugs, and set the controller. Several minutes later, the temperature inside the fermenter had dropped from 55F to 48F. As soon as it did, the controller cut off the pump. The fermenter remained at (or at least very near) the 48F temperature for over 24 hours. At that point, I swapped out the ice jugs in the cooler, and put the mostly-thawed jugs into the freezer for later use. With daily changes of the ice jugs, I should be able to keep the fermenter at 48F as long as needed. Since it's something new, I'm using my temperature monitors to determine how the temperature in the fermenter and ice water vary over time. This will help me determine how quickly the product can chill a fermenter and how long I might expect the ice water to remain cold enough to keep the fermenter under control. To take this system to the next level, I'm planning to purchase a small dorm-room refrigerator. My plan would be to cut two holes into the top of it and place a container of water inside. Then, I'd use the refrigerator to keep the water cold instead of the ice jugs. This would eliminate the need to change out ice every day or two... and would make me feel comfortable about attempting a lager style beer that might need to be kept in the 32F to 52F range for weeks at a time. With ice water, I'd be concerned that I might miss a day replacing the ice and let the beer get too warm. The constant temperature inside the dorm fridge would solve that issue. Jugs still have some ice in them after 30 hours. Pump in bottom right corner. Like most craft beer fans, I've read for years about the amazing Westvleteren XII beer. It's said to be one of the best beers in the world, and certainly one of the best of the Belgian monastery beers. Unfortunately, I've never seen a bottle of it for sale in Ohio. Ordering it over the Internet would mean spending as much as $25 per bottle plus shipping, which seems a bit excessive. What's a home brewer to do? Brew his own, of course. A number of people have told me that the folks at the CandiSyrup.com site have done a great job figuring out how to clone and brew many of the world's best beers. What follows here is their recipe for a Westvleteren XII clone beer, adjusted slightly because I discovered at the last minute I was missing one of the ingredients. I brewed the beer in the iMake RIMS system The Grainfather and fermented in an SS Brewing Technologies 7-gallon Brewmaster Bucket. Temperature control on this will be heat-only, using an Inkbird ITC-308 controller and a fermentation wrap heater. Past experience has shown that this, in combination with my relatively low ambient basement temperature, keeps the fermenter within 2-3 degrees Fahrenheit of the target fermentation temperature. Nevertheless, I'll be using a temperature monitor to take readings at two-minute increments from the fermenter's thermowell so that I can see how well the temperature control is working. The Grainfather calculations said that I would need 6.25 gallons of mash water and 1.75 gallons of sparge water. I put 6.25 gallons in the kettle and set the temp for 148F. I put 1.75 gallons into a separate kettle for sparging. This was heated to 170F about 20 minutes before the mash finished. As I began adding the grain, it became obvious that 6.25 gallons was too much water for a grain bill this size. The water level was about to fill the basket too full, so I extracted some of the water and unfortunately a small amount of grain, too. This enabled me to keep the level below the holes in the side of the grain basket and below the overflow pipe. I then adjusted the valve on the back of The Grainfather to flow approximately as much wort on top of the grain bed as was draining through it. I ran the mash for over 90 minutes to ensure complete conversion. The Grainfather was set to raise the kettle temperature to 170F for 10 minutes before I lifted out the grain basket and began sparging the grain. Pre-boil volume was 6.5 gallons and pre-boil gravity was X Brix on my refractometer. During the sparge, I set The Grainfather's kettle temperature to 180F to get it closer to boil temperature. When the sparge completed, I set it to full boil. The wort was then passed through The Grainfather's counter flow wort chiller and into the sanitized SS Brewing Technologies Brewmaster Bucket fermenter. The wort entered the fermenter at approximately 68F. Yield was just above 5.5 gallons and the starting gravity came out at 21 Brix on the refractometer. I inserted my sanitized oxygen stone and inserted it into the fermenter. The wort received 120 seconds of pure oxygen. A packet of Abbaye yeast was pitched directly into the wort. The fermenter was sealed and an airlock attached. 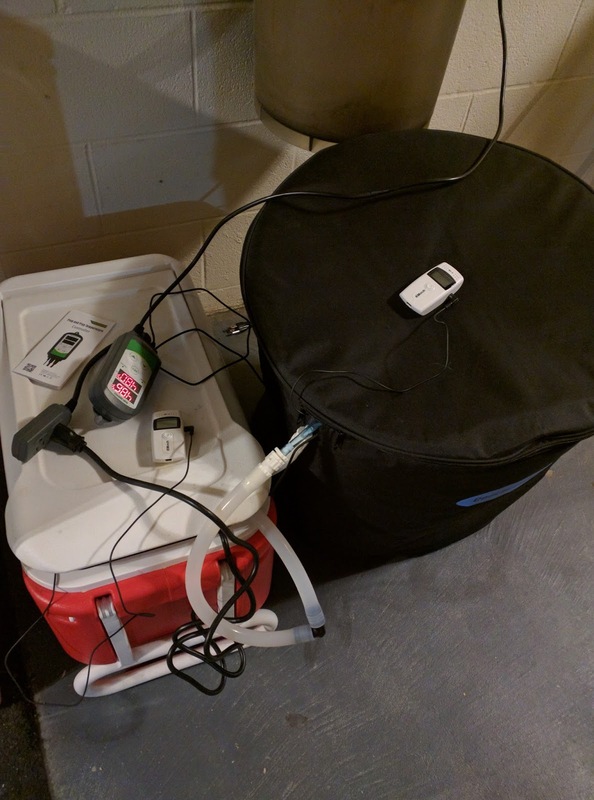 A fermentation wrap was placed around the fermenter and attached to my temperature controller. The recipe called for a final gravity of 1.013 to be achieved. April 17: Today I took a hydrometer reading of the beer. It registered 1.009, which means that it attenuated past the recipe's estimated 1.013 or 1.012. My refractomter registered 7 Brix from the same sample, or 1.0277 in standard gravity, which gives some idea of the inaccuracy of a refractometer when alcohol is present. The sample had a nice slightly reddish brown color, very cloudy (probably since yeast is still largely in suspension), and a pleasantly fruity aroma. The flavor was only very slightly sweet, but mostly dry with a balanced bitterness. It wasn't hard to drink the sample, even flat and at 77F. The chart below shows actual temperature in the fermenter throughout the one-week primary fermentation. Maximum temperature was 73.1F, which occurred about two days after the yeast was pitched. Ambient temperature where the fermenter was kept varied between 63F and 68F. 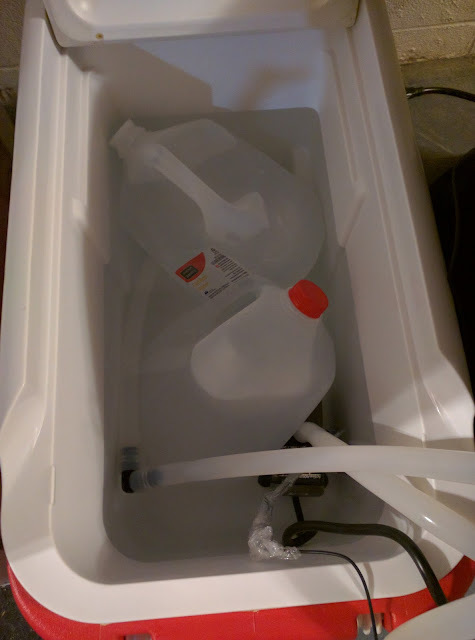 I transferred the beer to a secondary fermenter on April 17, placing it inside an insulated bag with two frozen one-gallon jugs of water. The intention here was to meet the recipe's requirement to crash the beer for 3-4 days at 55-60F from the basement's ambient temperature of 68F. The recipe then calls for keeping the beer at 45F for 8 weeks, which would put this some time into late June. I purchased a cooling jacket from Cool Zone, along with tubing and a pump. This has allowed me to keep the beer at 45F consistently for weeks now. Due to a family trip taken in mid-May, I had to cut the cold conditioning short by a couple of weeks. I bottled the beer using Coopers carbonation drops and its existing yeast. On June 4, I opened a bottle to see how it was doing at that point. I have to say it was a bit underwhelming. There was a hint of dark fruit, a noticeable hops bitterness but not an extreme one, and a relatively dry malt flavor. It certainly didn't remind me of the descriptions I've read of the real Westvleteren XII beer. On the other hand, the recipe called for a YEAR of conditioning in the bottle. I would have believed that a year of conditioning wouldn't change this beer that much. However, I did brew a Northern Brewer Westvleteren XII clone kit a few months ago. That kit produced a beer which, when fresh, tasted more or less exactly like this recipe. I ended up drinking a lot of it as soon as it reached the three-month mark Northern Brewer's recipe recommended, because I wanted to free up the bottles to fill them with something else. I opened one of those older bottles this past week and was surprised to find that it really had changed quite a bit. The malt flavors began to be a bit more complex and sweet, the hops bitterness had mellowed a little, and the dark fruit flavors seemed to have been punched up somewhat. I'm planning to box up the remaining bottles and stick them away in my cellar to sit for a year. I'll be back to update the notes some time in April 2017. If you've been home brewing for any length of time, you know the importance of maintaining an appropriate and consistent temperature during the fermentation of your beer. The goal is to keep the beer within a temperature range that allows your yeast to work its magic without getting too hot (and thus generating off-flavors) or too cold (and going dormant before finishing the job). I do all of my fermentation in my basement, which maintains a year-round temperature in the low-to-mid 60's (note: all temperatures referenced in the post are in Fahrenheit unless otherwise stated). I also have switched to only stainless steel fermenters, which I personally prefer to glass or plastic. 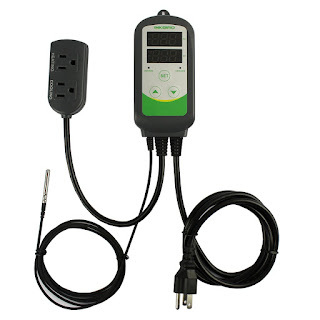 A few months ago, I acquired a fermwrap heater ($23.99) and an Inkbird temperature controller ($38.99 or less when on sale periodically). I'd been using these to keep my fermentation temperatures from getting too low, but worried that during vigorous fermentation that the yeast could be getting too hot. 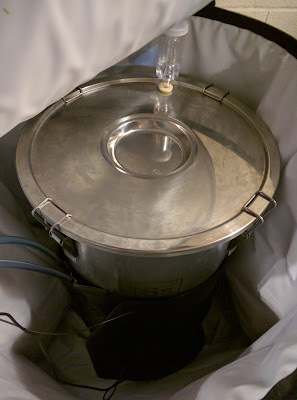 I wondered if I needed to "up my game" by adding a fermentation chamber that could both heat and cool, or if the low ambient temperature in my basement (combined with the conductive properties of the stainless steel) might be enough to prevent overheating. 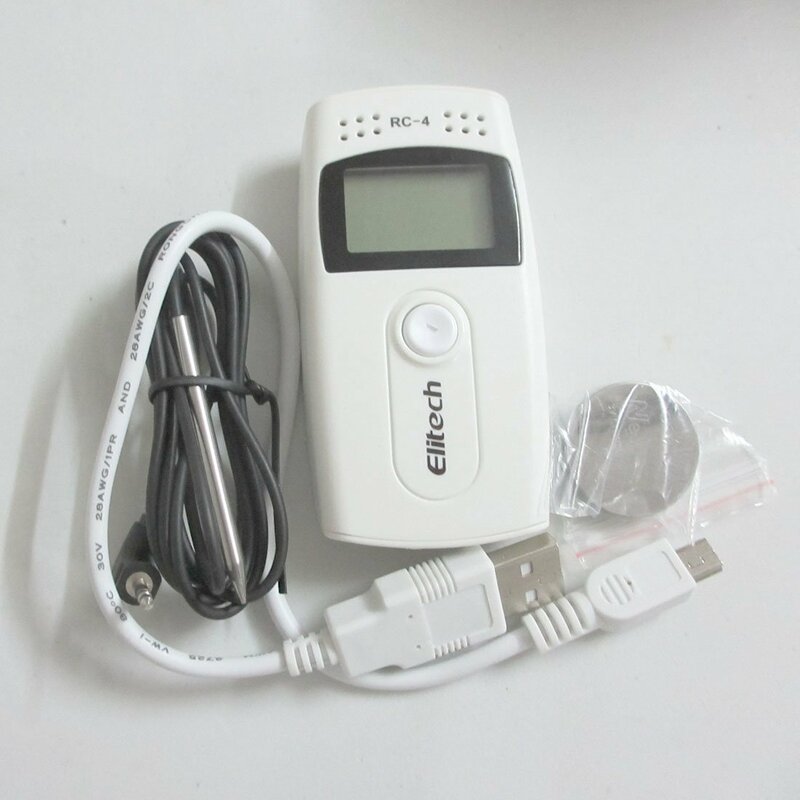 To test this, I purchased an inexpensive temperature monitor ($23.99) from Amazon. This model had a probe that I could fit in the fermenter's thermowell along with the probe for the temperature controller. To use this particular monitor, you begin by installing a battery in the monitor. Then, install (Windows only, I think) software on your computer. 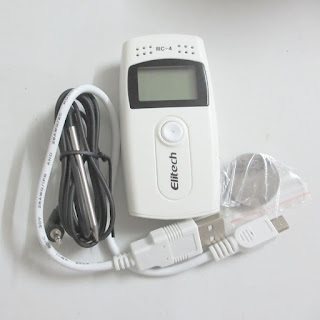 Attach the USB cable to the computer, and then to the temperature monitor. The software allows you to specify the frequency with which readings are taken, the delay time before readings start, the temperature unit (Fahrenheit or Celsius) to be used, and a unique name to assign to readings taken by the monitor (e.g., "Pale Ale" or "Fermenter 1"). When you've finished gathering readings, the software also allows you to extract the data from the monitor and store it in Excel, PDF, Word, or Text formats for later use. The monitor can store up to 16,000 readings in its internal memory. This works out to about 11 days if readings are taken at one-minute intervals, longer if readings are taken at longer intervals. I configured the monitor to take readings every minute, in Fahrenheit. 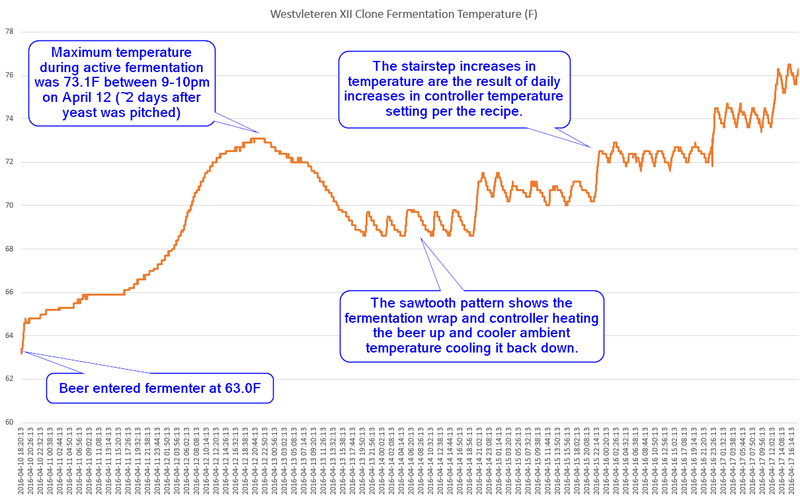 The sawtooth pattern you're seeing here is a result of the temperature controller using the fermwrap heater to heat the beer to the 70F target temperature, followed by a cooldown of the fermenter toward the basement's ambient temperature. You'll notice that about a quarter of the way through the chart that the temperature increases slightly. That's because I adjusted the controller to warm the fermenter a bit more, to hopefully help the yeast along. You can also see near the right-hand side of the graph that there was a sudden drop in the readings. This is was the day I transferred the beer to a secondary fermenter. I disconnected the temperature probe and fermwrap while I transferred the beer to the secondary, so it showed a sharp drop because it wasn't in the fermenter anymore. A while later, when I reinserted the probe into the secondary fermenter's thermowell, you see the temperature go back up. The gradual drop-off at the end of the graph is the result of electing not to keep the fermwrap and controller plugged in during secondary fermentation. Over a few days, the temperature in the fermenter began dropping to the basement's ambient temperature of around 63F at the time. For at least this particular recipe and yeast strain, the fermwrap, stainless steel, and cool basement air was more than enough to offset any heat generation by the fermenting yeast. The fermentation temperatures during the monitoring period (2-3 weeks) never exceeded the target for longer than one minute (each measurement above represents one minute). If this result holds true across multiple recipes and yeast strains, I may not need a fermentation cooling option for ale fermentation. It takes my fermwrap 30 minutes to raise the fermenter temperature by 1 degree. It takes the fermenter and ambient temperatures about an hour to drop it that same amount. My temperature controller seems to work properly, keeping fermentation temperatures within the range I specified. 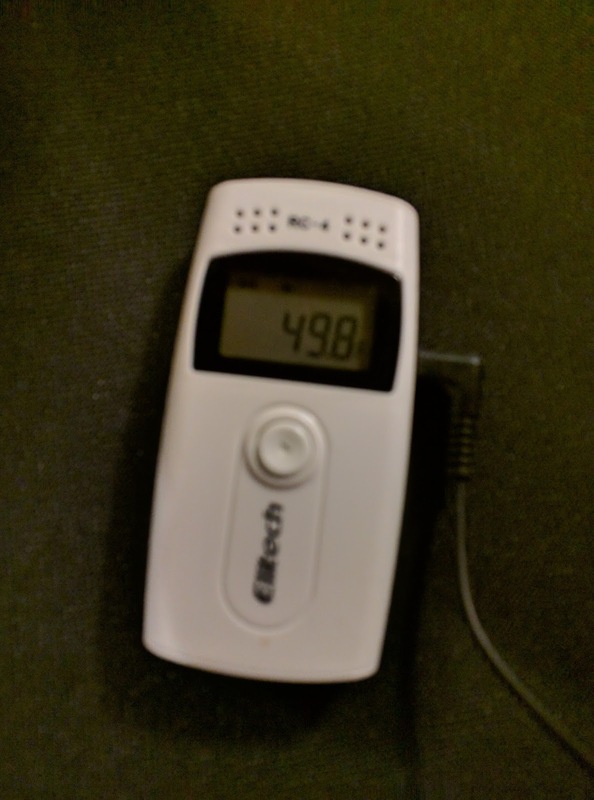 The temperature monitor also seems to be reading accurately, making it a useful tool for tracking fermentation temperatures. At least for this particular fermentation, the fermwrap heater ran for one hour out of every three hours. 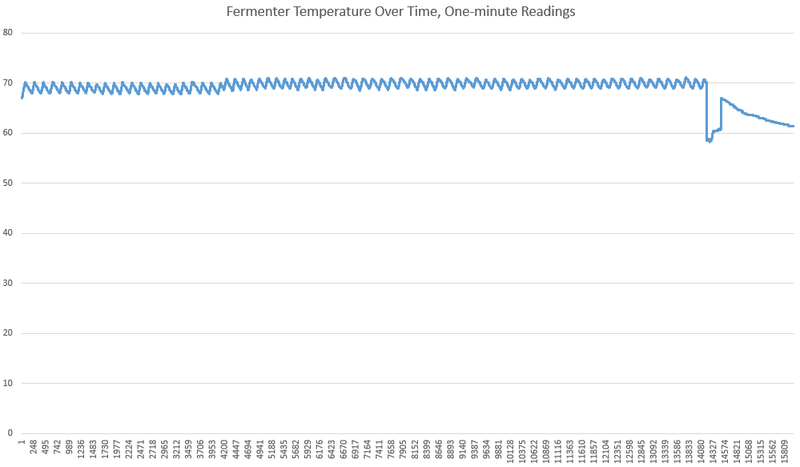 Given that this is only a set of data for a single fermentation, I can't draw any general conclusions yet other than that it does appear that my temperature controller and fermwrap heater are doing the job they're designed to do. It will take additional testing to determine if these results are repeatable across other yeast strains and beer recipes. If so, I won't need to invest the time and effort into a cooling option for ale fermentation. Like most home brewers, I've been gradually learning more and improving my skills over time. One of the areas I've been trying to improve is temperature control during fermentation and bottle conditioning. I'd ordered an expensive controller online which looked like the ultimate gadget. I found that its temperature probe was many degrees off and that it couldn't be calibrated to read accurately. I abandoned that model. Then I found an inexpensive one on eBay. That arrived from China. Its temperature unit was Celsius, which required conversion to Fahrenheit when I used it. That one seemed to be pretty accurate but wasn't so well-made. I used it for a while until I saw this InkBird unit on sale. For its relatively low price (around $39), I've been able to keep my fermentation temperatures in the range I wanted them to be. I combined this unit with a 40-watt Fermentation heater to provide heating. The low basement temperature combined with the conductivity of the stainless fermenter itself has (so far) provided all the cooling I've needed. I know this because I used a temperature monitor to track its function over a three week period and it kept temperatures right where I wanted them, in a narrow range between 68F and 70F. When I'm bottle conditioning, I use the controller and a seedling mat heater inside a beverage cooler to keep the conditioning beer at an even 72F for carbonation. The mat heater sits in the bottom of the cooler and the InkBird's temperature probe sits in the middle of the cooler measuring ambient temperature. This has worked well so far. While seeking a good Belgian Dubbel recipe, I encountered a recipe on the Home Brew Talk forum for "Award Winning Dubbel XL" by forum member DubbelDach. The recipe's author says it took third place overall in Appalachian Brewing Company's 2009 Homebrew Contest. The author described it as having deep dark fruit and chocolate tones, and very much like Trappistes Rochefort 10. I made some adjustments based on ingredients I had or could easily get locally. 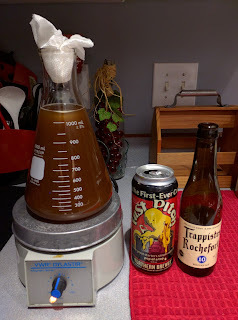 In last week's post, you'll notice that I used Fast Pitch Starter Wort to grow a batch of actual Rochefort yeast from a bottle of Rochefort 10. That's the yeast we'll be using here. The photo at the left is of my first round of starters for the yeast. I began with a 1 liter starter, then graduated to a one gallon starter to further grow the yeast. If you don't have that or don't want to grow your own yeast, the original recipe recommended White Labs WLP530 Abbey Ale yeast. I'm sure that would do well with the recipe also. 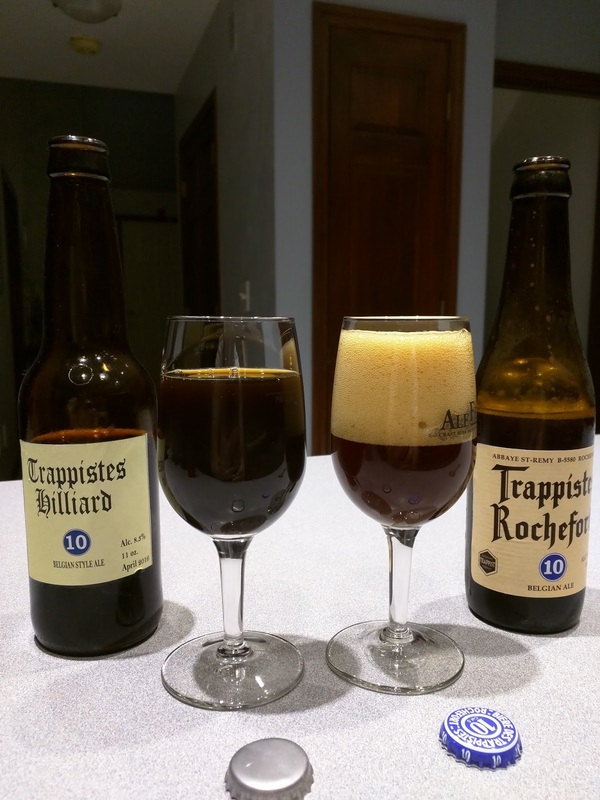 The actual Rochefort 10 beer reportedly has an original gravity of 1.097 or 22.9 Brix. It also reportedly has 27 IBUs, so this clone is likely to come out a little less bitter and at a lower alcohol content than the original. I used The Grainfather for this recipe. Their mash calculation suggested 5.5 gallons of mash water for the recipe, which works out to 1.66 quarts per gallon. It also suggested 2.2 gallons of sparge water. While this figure seemed unusually high to me, I went with it. I put 5.5 gallons of water in the kettle and added a quarter of a Campden tablet to remove chlorine and chloramine from the tap water. I let this work while The Grainfather heated the water to 154F. I came back an hour or two later, then stirred in all the grain and installed the perforated lid over the grain. I started the recirculation pump and left it. At this point, I took some time to transfer a previous brew to a secondary fermenter, clean out that fermenter, assemble a new fermenter, etc. Then I even went out to dinner and came back. In the end, this mash ran for about 7 HOURS. I heated the sparge water and brought the wort to the mash out temperature of 167F. The grain was sparged using the heated water. This yielded 6.5 gallons of wort at approximately 7 Brix. The Grainfather tends to boil off a little under a gallon in an hour, so I knew I was looking at a long boil to get the final volume I wanted. The mash yielded a wort that was considerably higher in volume and lower in gravity than expected. BeerSmith suggested an 18.9 Brix pre-boil gravity, but I got more like a 7 Brix. I boiled the beer for about an hour before the first hops addition, to reduce the volume and increase the gravity. My post-boil volume came out a little under 5 gallons, with a gravity of 22.1 Brix, which was a little higher than BeerSmith's suggested 21.1 - but the reduced volume probably accounts for that. I oxygenated the wort for 120 seconds with a tank of pure oxygen and an oxygen stone. This, combined with the yeast nutrient would, I hoped, give the cultured Rochefort strain everything it needed to take off and begin fermenting. I have no way to be sure how many cells I have in the Rochefort culture, so no way to know if this is underpitched or overpitched. Since underpitching is common in Belgian monastery practice because it brings out the esters in the yeast, I'm not too concerned unless there are no signs of fermentation in the next three days. After two weeks in the primary fermenter, I took a gravity reading of the beer with a hydrometer. I registered 1.030, which was higher than expected but it had not changed for a week. When I opened the fermenter, the yeast had completely flocculated to the bottom of the fermenter and the beer looked clear. After tasting the sample used with the hydrometer, I decided to forego secondary fermentation and just bottle it. On April 9, I bottled the beer with 5 ounces of corn sugar and a packet of Lallemand CBC-1 cask and bottle conditioning yeast. Since I've had issues with some beers not seeming to carbonate as much as I'd like them to, I also dosed a few of the bottles with a Coopers Carbonation Drop to see how they turned out. All the bottles were placed inside closed containers in case they exploded. April 3, 2016: After 2-3 days in the primary, I saw very little indication that the Rochefort yeast had awakened and started fermenting. The only vaguely similar yeast I had on hand at the time was a packet of dry Safale S-04 English Ale yeast, so I pitched that rather than leave the wort unfermented any longer. The next day the airlock showed signs of activity and there was a krausen on the beer. Today I did a gravity check and the reading had dropped from the initial 22.2 Brix to 13 Brix. This is with a refractometer, so the actual gravity is probably different. April 9, 2016: The beer was bottled with CBC-1 and 5 ounces of corn sugar. On or about April 23, I'll chill and open the first bottle for carbonation and taste testing. The initial flat, warm samples from the fermenter did seem to resemble Trappistes Rochefort 10, though I'll want to do a side-by-side test in the future to confirm. Tonight (April 29, 2016) I did a side by side comparison with a real bottle of the beer. The color on mine is a touch darker than the real Trappistes Rochefort 10, which is slightly reddish. My clone inexplicably doesn't seem to get a head on it, while the real beer has a very thick tan head as you can see in the photograph at left. The head on the real beer stays there for quite a while. A bottle of mine, poured into a chilled glass, will generate an incredible amount of head like the original beer. The aroma of my clone is perfect. To my nose, it smells exactly like Trappistes Rochefort 10. The carbonation level on mine is much lower, except for the bottles with the extra carbonation drop. Those seem to have a nice effervescent level of carbonation. They still don't get a head on them like the real beer. The flavor of the real beer, compared to my clone, has a bit more caramel flavor to it and has a bit more of a burn because it's quite a bit higher in alcohol content, but it's otherwise very close. To my taste buds, the bitterness level is pretty much identical as well. The lack of the caramel flavor and a nice head are pretty much all that I can complain about on this one. Replace some of the two-row pilsner malt with Caramel 40L to pick up the caramel and toffee flavors of the real beer. Avoid using Fermcap-S during the boil, in case that's the cause of my beer's lack of head. Add Carapils, Carafoam, and/or another grain with foam enhancing qualities in place of some of the 2-row, to see if that helps with head and retention. I have to say that overall I am extremely happy with this beer. Friends who have tried it have used the words "outstanding" and "awesome" to describe it. Even if they didn't, I'm very happily drinking it myself - and that's the whole reason I got into home brewing. I wanted to make beers that I loved, whether anyone else liked them or not.